The girl has a wonderful idea. "She is going to make the most MAGNIFICENT thing! She knows just how it will look. She knows just how it will work. All she has to do is make it, and she makes things all the time. Easy-peasy!" But making her magnificent thing is anything but easy, and the girl tries and fails, repeatedly. Eventually, the girl gets really, really mad. She is so mad, in fact, that she quits. But after her dog convinces her to take a walk, she comes back to her project with renewed enthusiasm and manages to get it just right. I adored this picture book! 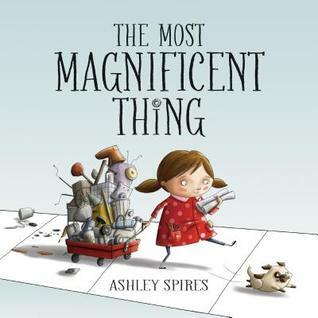 Filled with illustrations that made me grin, The Most Magnificent Thing teaches a wonderful lesson about perseverance and working through the bumps in things, even when it seems like your idea has no merit. I especially love how Spires shows the nameless little girl's progression from a brilliant idea, to anger over it not working the way she wants, to giving up, and all the way around to success. Definitely a book for your storytime library, and a book I look forward to adding to my own library for future munchkins.